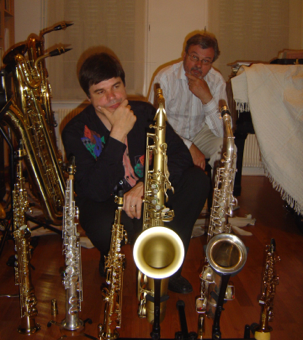 The familly of saxophones counts 7 members, of which 4 (SATB) are usually employed, especially in the quartet form. 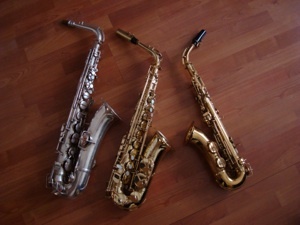 Bass & sopranino saxophones are rarer, but are often used in saxophone ensembles of 12 saxophones. The contrabass was almost virtual until recently, since only 20-30 models were built between Saxs’ invention in 1842 and 2000. 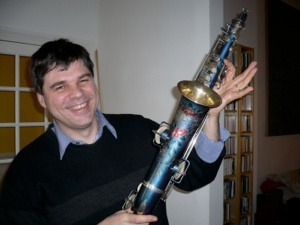 But the invention of a new and compact model in 2000 (the tubax, conceived in München by Benedikt Eppelsheim) changed radically the perception of this instrument. the compositions multiplied and almost 70 tubaxes were built till this day. Other makers joined this pioneer and many models can be found now. The successive development of the soprillo, a piccolo sax in Bb, a little more difficult to master but who has a very specific sonority, will extend even more the limits of the traditionnal familly of the saxophones in Bb and Eb (already 120 exemplaries around in 2012). Som pioneers decide to develop the technical and musical potential of these instruments. I’m pleased to bring my own modest contribution to this noble quest. Of course, Sax built few of these instruments, but ... they knew their moment of glory during a short but memorable period of history : during the years which preceded the great depression in 1929 in the United States. The american makers, following the needs of a saxophone-crazed public, developped models of incredible diversity. Of which a few survivors can still be available nowadays. These are far from being loin d’être anecdotic instruments : their sonorities are very specific, often «in the middle» between Bb and Eb instruments ... The C soprano, a major second higher than the Bb soprano but a minor third lower than the sopranino, sounds like an intermediary between those two instruments. Similarly, the C-melody tenor, sounds as an intermediary between alto et ténor. As for the F Mezzo-soprano by Conn, nearer the alto by its tube length, its sonority is in fact more of a low soprano, by the fact that its section is much smaller than the alto. What a pity that for almost 80 years those instruments were almost completely forgotten, although they might have been so practical for composers (some are not transposing instruments) ! And they could have brought so much with their specific colour palette. Soprillo (piccolo in Bb), C-melody Tenor, Bb Tenor, sopranino, C soprano, Bb soprano, baritone, tubax ... some extra-ordinary saxophones among some more known ones. At the back of the room, the composer Jacques Lejeune, author of «Fragments gourmands» for 7 successive saxophones and recorded background. Three instruments looking like an alto : a Conn C-melody, a Selmer alto and a Mezzo-soprano (Conn too).